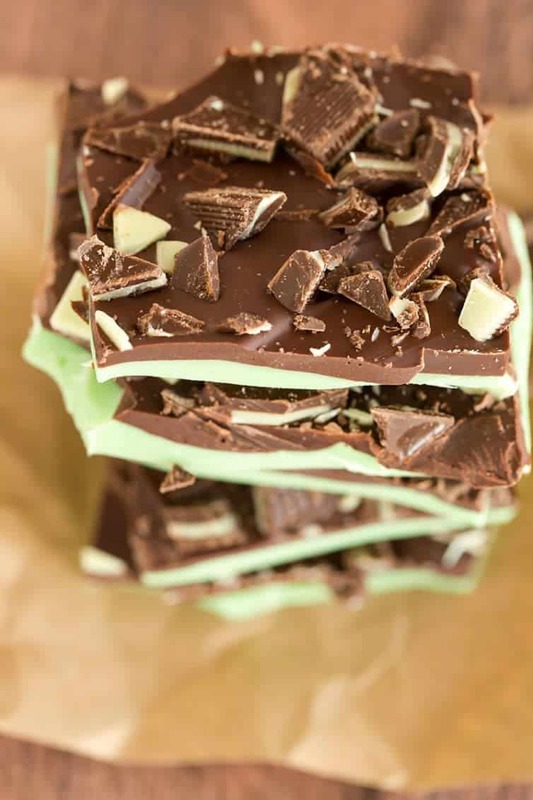 This Grasshopper Chocolate Bark combines the chocolate and mint flavors from the famous cocktail without the alcohol – perfect for a St. Patrick’s Day party! I have been head-over-heels in love with chocolate bark since I discovered peppermint bark over ten years ago. It’s become a Christmas tradition in my kitchen, and I have since added tons of different variations to my repertoire (some favorites include toffee pretzel bark, cake batter & sprinkles, and leftover Halloween candy bark). 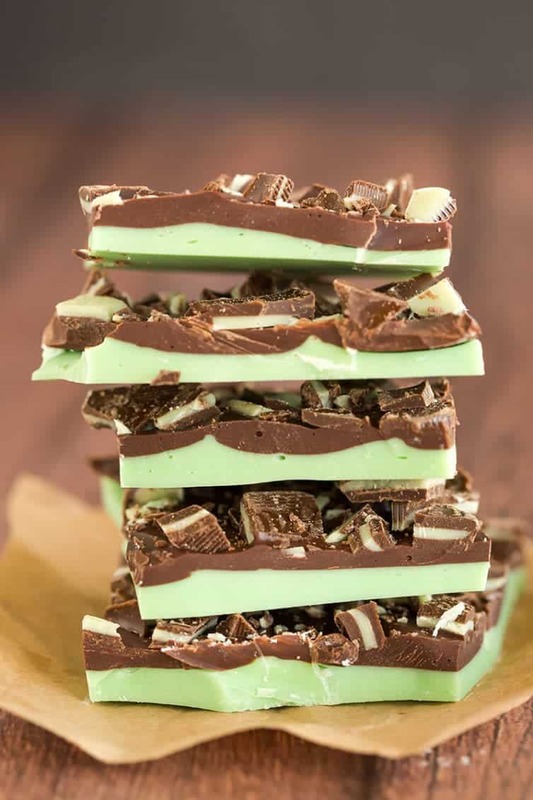 This grasshopper chocolate bark was inspired by the classic drink that features green crème de menthe and white crème de cacao for a wonderfully smooth chocolate-mint cocktail. If you want an easy sweet (and green!) treat for St. Patrick’s Day, look no further! I have been a huge fan of Andes mints since I was a kid and my parents would take us to Olive Garden. Getting the check with those mints was always the best part, in my opinion. Bonus if the waiter was awesome and dropped a whole fistful on the table! 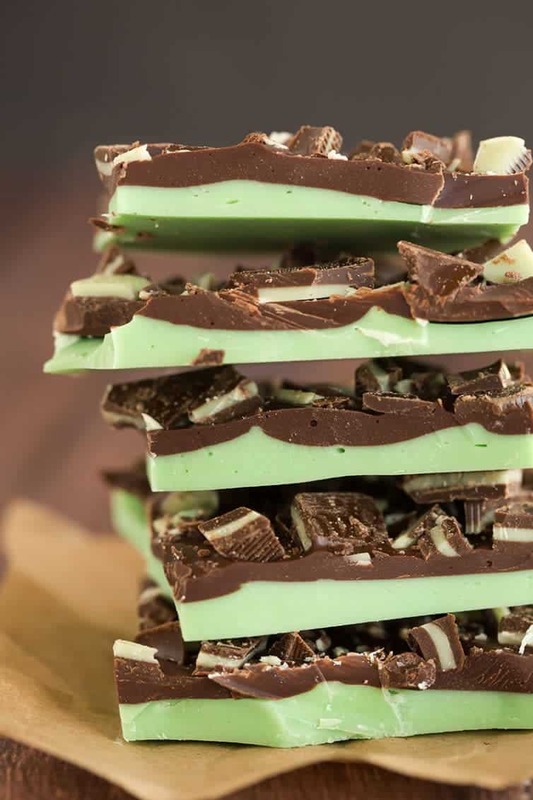 I always keep a box of them in my candy stash, so there was no question I needed to use them in this minty bark concoction. Chocolate bark has a lot going for it – it’s easy to make, it’s quick, it’s no-bake, it’s highly customizable, and it will keep for weeks in the refrigerator. I used the same basic formula for this bark that I use for just about all of my other ones. I added a little mint extract to the white chocolate layer – I loved it, but if you’re not head over heels for mint flavor, you could absolutely leave it out. Go with your personal tastes – you do get mint flavor from the Andes mints, and that might be just enough for most people. Likewise, use those green food drops as you see fit – light green, dark green, whatever you want! If you’d like more grasshopper-inspired recipes, you’ll love grasshopper pie, grasshopper brownies, grasshopper milkshake, and this fabulous grasshopper poke cake. This combines the chocolate and mint flavors from the popular cocktail, minus the alcohol. Make it for your St. Patrick's Day party! Line a quarter-sheet or jelly roll pan with parchment paper and set aside. Melt the white chocolate over a double boiler (or in 30-second intervals in the microwave on 50% power, stirring after each). Once the chocolate is melted, add the mint extract, if using, and stir to combine. Add a few drops of green food coloring and stir until desired color is reached. Meanwhile, melt the semisweet chocolate over a double boiler (or in 30-second intervals in the microwave on 50% power, stirring after each). Once the chocolate is melted, remove from the heat and pour over the white chocolate layer and spread evenly over top. Sprinkle with the chopped Andes mints and press down lightly to push the mints into the top chocolate layer. Refrigerate for at least 30 minutes, until completely set. Transfer the bark to a cutting board and use a sharp knife to cut into pieces. Store in an airtight container in the refrigerator for up to 2 weeks.